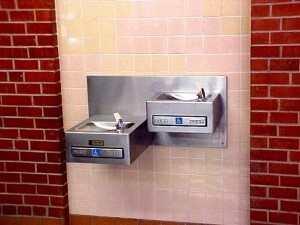 There’s often stories in the news about how school water fountains are contaminated with germs and the school water pipes are a bacterial minefield so it’s high time schools started cleaning up their act before all the school drinking fountains are taken out from the halls! The latest news story was from Oregan in the United States where a student was so adamant that the school drinking fountains were more dirty than the school toilets that he conducted a series of tests to prove his theory correct. For his English assignment he collected swabs from four of the school’s water fountains and one of the toilets to test the bacteria content. The tests came back in favour of the toilet water, with all results from the water fountains coming back infused with bacteria. His classmates and teachers were shocked at the results and it quickly spurred on the decision makers in the school to replace the old water fountains with sparkling new ones which will be sanitised on a much more regular basis. Now the results of this test would never come back in favour of the toilet water in any of the schools around here, if you keep your water fountains sanitised regularly you will never have this problem. If you know your school is in dire need of a new drinking fountain please feel free to contact Drinking Water Fountains and they will be more than happy to provide you with bacteria free fountains for your school! For any information on drinking water fountains or to speak to someone about having a water fountain installed please contact us on contact@drinkingwaterfountains.co.uk or 0845 500 4455.